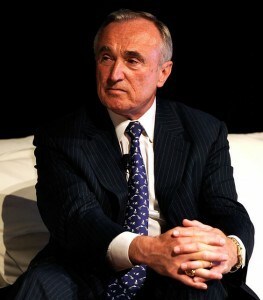 Former New York City and Los Angeles police chief William Bratton is coming to Oakland as a consultant to the city's struggling Police Department. After a nine-hour meeting and four hours of public comment, the Oakland City Council voted 7 -1 early Wednesday to approve a $250,000 dollar contract that retains Bratton and his firm. Mayor Jean Quan and Police Chief Howard Jordan want Bratton to help the city respond to a crime siege that took 131 lives last year and led to a surge in robberies and burglaries throughout the city. Budget cuts have thinned the city's police force, and the department is operating under court order to reform past civil rights abuses. Many in the overflow crowd last night denounced Bratton's support of aggressive tactics like gang injunctions and stopping and frisking people. But though some members of the audience also denounced the councilmembers for inviting racial profiling and ignoring the roots of crime in the community, others said it's time to try new tactics. “We support (bringing in Bratton), because what we’re doing now is we’re trying to do something," said Pastor Gregory Payton of Oakland's Greater St. John Baptist Missionary Church. "It may not be perfect. But at least we're trying to do something to protect our children and protect the future of this city." Police Chief Howard Jordan tried to reassure residents police will respect residents' rights. Oakland Local, Chronicle reporter Matthai Kuruvila and Inside Bay Area Online Coordinator George Kelly were among those who Tweeted live from the meeting. We've collected some of their Tweets into a Storify below.